Donald Tusk has poured cold water on hopes of a Brexit breakthrough at Wednesday's EU summit, saying the Irish border was still a sticking point. 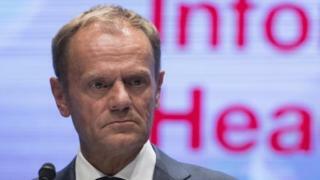 The European Council president said he had "no grounds for optimism" it would be solved at the summit. And he called on Theresa May to come up with "concrete proposals" to break the "impasse". The prime minister told her cabinet a deal was within reach if the government "stand together and stand firm". Asked if she would be coming forward with "concrete proposals" at the summit, Mrs May's official spokesman said: "The prime minister set out her position yesterday (Monday). She looks forward to a face-to-face discussion with him tomorrow. "There are many areas where we have made progress. More progress is needed on the backstop." 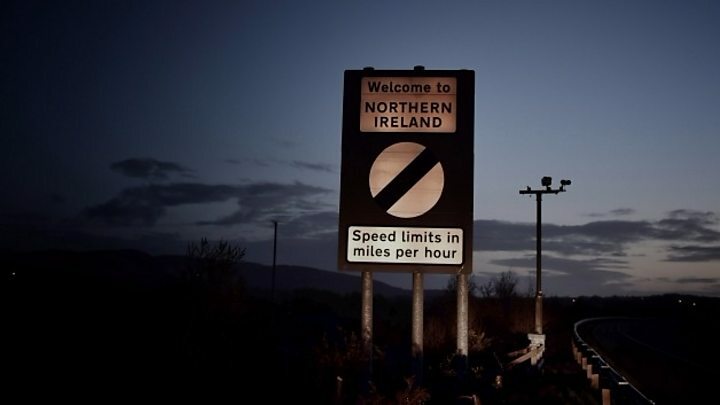 The "backstop" is a fall back plan for avoiding a hard border in Ireland if the two sides can't strike a trade deal in time - but they can't agree on how long it should last and what form it should take. Mrs May had already put forward a "workable solution", Downing Street said. Speaking at a press conference in Brussels, Mr Tusk said: "As I see it, the only source of hope for a deal for now is the goodwill and determination on both sides. "However, for a breakthrough to take place besides goodwill we need new facts. "Tomorrow (Wednesday), I am going to ask Prime Minister May whether she has concrete proposals on how to break the impasse." Media captionTheresa May's Brexit update statement: "The terms of our exit are now clear." He urged Mrs May to present "something creative enough" to break the deadlock. He said EU leaders would discuss how to step up preparations for a "no-deal scenario", but stressed that did not mean they were not also making "every effort to reach the best agreement possible for all sides". The UK and the EU had hoped that enough progress would be made at Wednesday's EU council meeting to call a special summit in November to finalise the terms of the UK's exit. Asked if the November summit would still go ahead, Mr Tusk said: "It's for the leaders to decide whether we need an extraordinary summit in November or not. "Logistically, we are ready, but we need the feeling that we are close to a real breakthrough. The clock is ticking." Downing Street said Mrs May has told cabinet ministers not to be "downhearted" if the European Council does not set a date for a November summit, amid growing expectation in government that any final agreement may be pushed back to December. The cabinet had discussed a "mechanism" that would avoid an indefinite customs union if a full trade deal cannot be agreed by the end of the 21-month transition period that is due to kick in after the UK leaves on 29 March - the so-called "backstop" plan. But it was "not a decision-making cabinet", Downing Street said. However, the EU is considering a proposal for a UK-wide temporary customs arrangement, Mrs May's spokesman added. 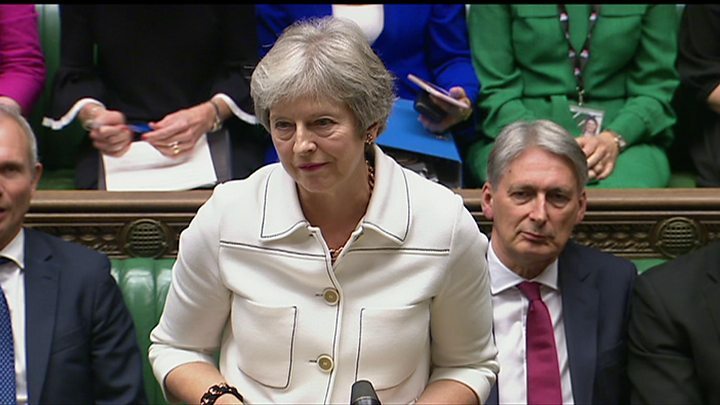 The prime minister told ministers progress had been made in Brexit talks on the "future framework" for trade and although there would be challenging moments ahead a deal with Brussels was within reach, Downing Street said. "I am convinced that if we as a government stand together and stand firm we will achieve this," she said. Mrs May used Tuesday's cabinet to rally support for her position among senior ministers, amid reports eight of them had met on Monday to discuss their concerns about it. Downing Street said none of the eight - Dominic Raab, Jeremy Hunt, Michael Gove, Penny Mordaunt, Chris Grayling, Liz Truss, Andrea Leadsom and Geoffrey Cox - had threatened to quit at Tuesday's cabinet meeting and it was clear that she had strong support. The EU's chief Brexit negotiator Michel Barnier, who is travelling to Luxembourg to brief EU leaders ahead of Wednesday's summit, said he hoped a deal with Britain was possible "in the coming weeks". "We are still not there. "There are still several issues which remain unresolved, including that of Ireland, and therefore what I understand is that more time is required to find this comprehensive deal and to reach this decisive progress which we need in order to finalise these negotiations on the orderly exit of the United Kingdom."